Today in Mallow Tipperary Ladies earned a hard earned but well deserved historic first Munster ever football title at this grade by defeating a strong Clare side. Behind by five points at half time Tipperary had it all to do with Clareâs Niamh OâDea and Ailish Considine being the two Clare forwards doing most to deny Tipp the title. Clare had the advantage of a fresh breeze during the first half but it was Tipperary who opened the scoring with two unanswered points from the Cahir duo of Aishling McCarthy and Aisling Moloney within two minutes. Clare however replied with a fine goal having cut the defence apart and Ciara Hickey giving Tipp goalie Patricia Hickey no chance. Clare followed this up with a point from Ailish Considine and Tipp were now behind by two points and it was Clare who looked the more determined side. Tippâs Aisling Moloney had another Tipp point but now Clare hit a purple patch and scored three unanswered points to put the banner ladies three points to the good with sixteen minutes played, Niamh OâDea and Ailish Considine doing the damage. Clare had a packed defence and were content to break at speed with these two being the targets up front. Tipp's Moloney and Catriona Walsh now hit two points for Tipp to narrow the gap but once more Clare fired over three of their own by way of an instant reply. Tipp tried hard to claw back the lead but when the Clare keeper saved well from Aisling McCarthy on twenty five minutes it looked ominous for Tipperary heading towards half time. Clareâs OâDea had another two points with Tippâs McCarthy managing a pointed free just before half time. Despite being behind by five points at half time anyone who knows the character and strength of this side were not giving up yet. Tipperary would have wind advantage in the second half but would also have to come out in a more determined manner and take the game to Clare for the duration. The second half begun with Clare opening the scoring and again it was OâDea who stroked over a beautiful point from play. Gillian OâBrien had come on during the half time break and she was now busy getting onto a lot of ball. 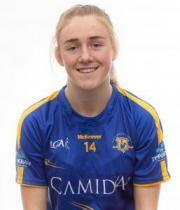 The experienced Mairead Morrissey showed great determination to fist over a nice point after evading a number of tackles and there then followed three unanswered points by Tipperary, Edith Carroll with two and Gillian OâBrien with one. The play was slowly but surely turning in Tippâs favour but a goal would surely be needed to swing the result Tippâs way. Clareâs OâDea had another point but the Tipp defence and midfield were now showing for early ball and Tippâs pressure up front was telling and frees conceded were duly punished by Tippâs McCarthy. Clare were not done yet however and Clareâs OâDea was now coming outfield in order to get on more ball. Tipperary 0 :10 points Clare 1:10 with 11 minutes played into the second half. Two more pointed Tipp frees by McCarthy in the thirteenth and nineteenth minutes now saw just the minimum between the sides and Tipp were finishing strongly. Clareâs OâDea again put two between the sides but not to be outdone Tippâs Aisling Moloney immediately cancelled this out with a beautiful rallying point from distance. OâDea for Clare and another Moloney point for Tipp again left just a point between the sides with three minutes plus stoppage time remaining. The turning point and decisive score came in the twenty ninth minute when following some wonderful defensive harrying work by Tippâs Jennifer Grant and Anne OâDwyer saw the ball moved quickly upfield. Moloney gathered the ball in the corner and when her pin point pass picked out the powerful run by midfielder Lorraine OâShea who accelerated through the centre, the midfielder made no mistake with just the goalie to beat. Goal and now three points up Tipp were not to be denied but still Clare pressed for the goal but had to be content with another point from play. Tipp's insurance point came from Moyle Rovers Gillian OâBrien into stoppage time when she stroked over one of the sides best points at distance from an acute angle with thirty four minutes played. The Tipp supporters were calling on the referee to call time which was now at his discretion. When referee Seamus Mulvihill did call time there were wild scenes of delight for this Tipperary side and their supporters. This win goes a long way in making up for the disappointment of losing a replayed league final some months previously. This was a win forged from the longs dark winter training sessions in mud and rain. At no stage did these wonderful ladies admit defeat today when their backs were up against the wall. Each and every one of them gave there all for the Tipperary jersey. The panel is big and every player continues to contribute to this journey. Big calls were made before and during this game by the management who deserve the praises due. Tipp will now move forward from this match, learn from it and be stronger going forward. They now await the winners of Down who play the winners of Wicklow/Roscommon in the qualifiers to decide their All Ireland semi final pairing. It could well happen that Tipp and Clare may yet again meet in this yearâs championship. Final Score Tipperary 1:16, Clare 1:13. The perfect ending to a perfect day ! Tipperary : Patricia Hickey, Laura Morrissey, Samantha Lambert, Anne ODwyer, Jennifer Grant, Brid Condon, Cliona ODwyer, Lorraine OShea (1:00), Sheelagh Carew, Edith Carroll (02), Mairead Morrissey (01), Eimear Myles, Catriona Walsh (01), Aishling McCarthy (5,4f), Aishling Moloney (05). Subs Used : Gillian Obrien (02), Aoife Ryan, Kate Davey, Emma Buckley. Panel : L Fitzpatrick, B Ryan, B Ryan, C Mullins, S Delahunty, S Condon, M Curley, G Condon, A OShea, R McGrath, R Crowe. Management : Gerry McGill, Peter OLeary, Una OBrien, Jim Kilty, Michael Nash, Richard OBrien, Elaine Harte. Physio Marie Aherne.